A reassessment of Old English female power from pre-Christian times. 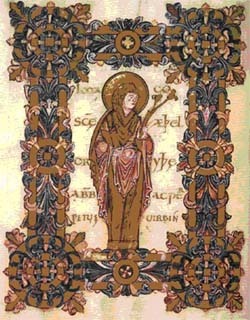 The power of pre-Christian English women is revealed by references provided by Procopius and Bede, as well as by Old English poetry. We shall see how this power was realised in early Christian England by the impressive numbers of canonised royal abbesses. Among the Wuffings we have the daughters of Rædwald’s nephew, King Anna. These include the famous St Æthelthryth (Audry), founding abbess of Ely, whose festival day this is, as well as her sisters, St Seaxburh, queen of Kent and founding abbess of Minster on Sheppey, and St Wihtburh, Abbess of Dereham. We shall further consider the extraordinary story of St Balthild, a lady of apparently English, possibly even East Anglian, noble family, who was enslaved by the Franks, but who later became a princess, queen, abbess and saint. Finally we shall note examples of powerful women in later Anglo-Saxon England. A	fter early experiences in archaeology, Sam Newton graduated from the University of East Anglia with a first in English Literature in 1983. He was awarded his Ph.D. in 1991 and published his first book, The Origins of Beowulf and the pre-Viking Kingdom of East Anglia, in 1993. Since then he has worked as an independent scholar in Wuffing and Early Medieval Studies. His latest book, The Reckoning of King Rædwald, was published in 2003. He is also now a Director of Wuffing Education and Time Team historian.